Something I love when at festivals, fairs, or Christmas markets are candied nuts. It may be one of the most profitable things ever, because you pay $4-6 for a small cone of nuts, when you could make a pound or more at home for the same cost. This is another delicious recipe from All Recipes. Preheat oven to 350. 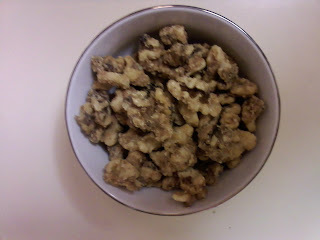 Spread nuts in a single layer on a baking sheet. Roast for 8-10 minutes until the nuts turn brown and the kitchen smells awesome. Stir together sugar, cinnamon, salt, and milk in a medium saucepan. Cook over medium high heat for 8 minutes or until the mixture reaches the softball stage (236 degrees - here in Colorado, I've found you've got to go down about 10 degrees because of the altitude). Remove from heat and stir in vanilla immediately. Add walnuts to syrup and stir to coat well. Spoon nuts onto waxed paper, and immediately separate nuts with a fork. Cool and store in an airtight container.